JORHAT: Assam government today announced to conduct the last rites of former Union Minister Bijoy Krishna Handique with full state honours. 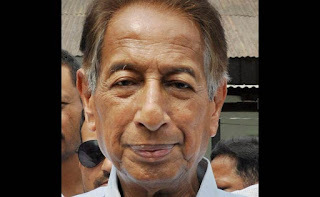 Condoling the death of the senior Congress leader, Assam Chief Minister Tarun Gogoi asked Education minister Sarat Borkotoky to attend the last rites of Handique. We can never forget Handique's contribution to the society. We worked with utmost sincerity to solve the problems of the state," Mr Gogoi said after paying floral tributes on his body in Jorhat. The six-time Lok Sabha member always worked for upholding democratic values and his demise is an irreparable damage to the state, the Chief Minister added.